You don’t want to lose those visitors or contacts just because they’re not ready to buy. You want to convince them you’re the business to come back to when they are ready. 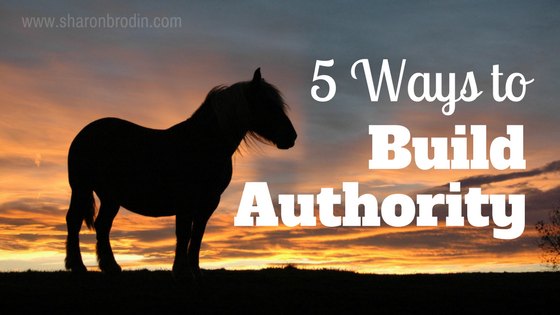 You do that in part by building your authority. Establish yourself as an expert in your industry or field and you’ll be on the short list of of your prospects when they’re ready. People will trust what others say about you more than what you say about yourself. It’s awesome when a happy customer sends an unsolicited testimonial (an email thanking you…a phone call). Ask if you can use it in your marketing material and website. Most of those who won’t think of giving you a testimonial on their own will be happy to if asked. If possible include a first and last name, and where they live or work. A photo is even better. It all adds credibility to their comments. Ask your LinkedIn connections for a recommendation. If they agree, ask if you can use their words on your website and other marketing collateral too. What problem were they facing? How did you help them with the solution? These will likely include an interview with your customer, direct quotes and a photo or two. I’ve lumped these together as they’re publications that can all be produced electronically and set up as downloads from your website. Whether they’re offered as free content, for lead generation, or for sale, they all will help establish your company’s authority. When you produce helpful, valuable, informative, educational content your prospects and customers know that you know your business and industry. They’ll start to see you as a go-to expert. Help build your authority with each posting. Provide the fresh, original and regular content the search engines love. Serve your customers and prospects by freely giving them valuable, helpful information. Some big companies update their sites daily or many times a day with this kind of content. But even once a week will steadily build the kind of content your visitors will come to appreciate and respect. This could be speaking at an industry or association convention, a local Chamber of Commerce meeting, teaching through Community Education — anywhere your target audience gathers. Live speaking is one of the best ways to become recognized as an expert quickly. It’s a natural networking avenue too, as you connect with those in your audience on a personal level before and after your speech or training. Be sure you display your speaking schedule on your website, as well as videos of your recent presentations. When you use these and other ways to build authority to your target market, they’ll come to know and trust your experience and knowledge. 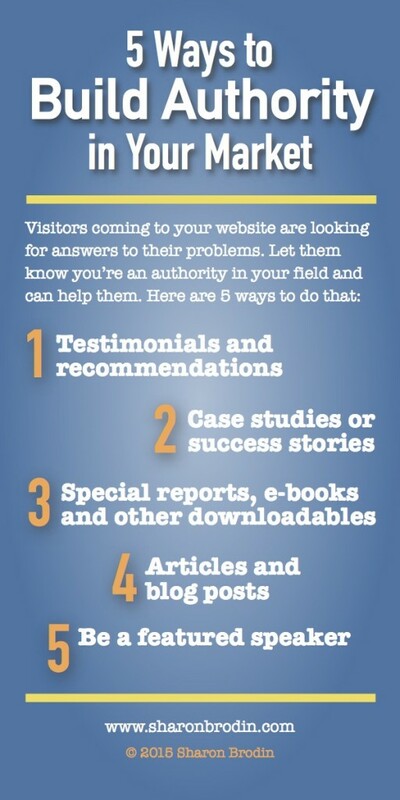 Have you used any of these for your own marketing? What’s worked the best for you? If not — pick one, add it to your marketing plan and build your authority. Pingback: Are You Marketing to Your Most Valuable Audience?